Yesterday I posted a video on the Muck Creek Kennels facebook page. 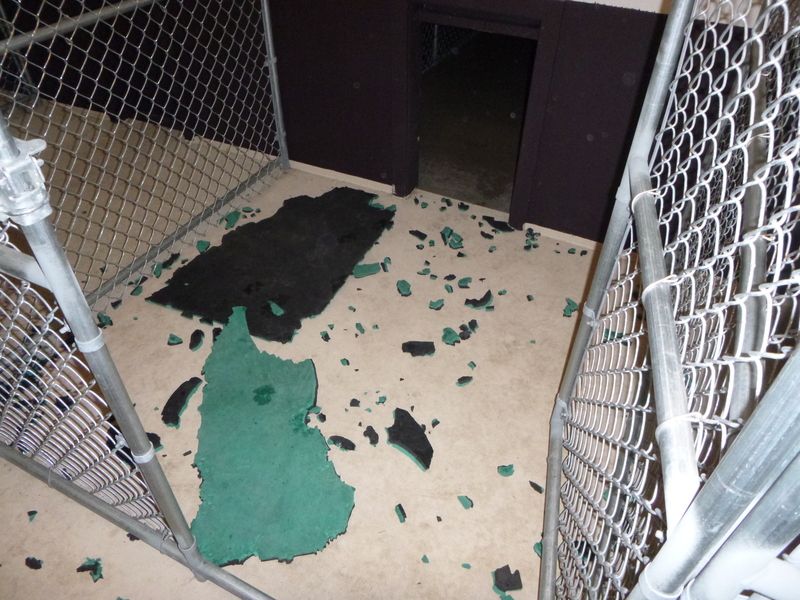 The video showed a kind of taste test that happened at the kennel yesterday morning. 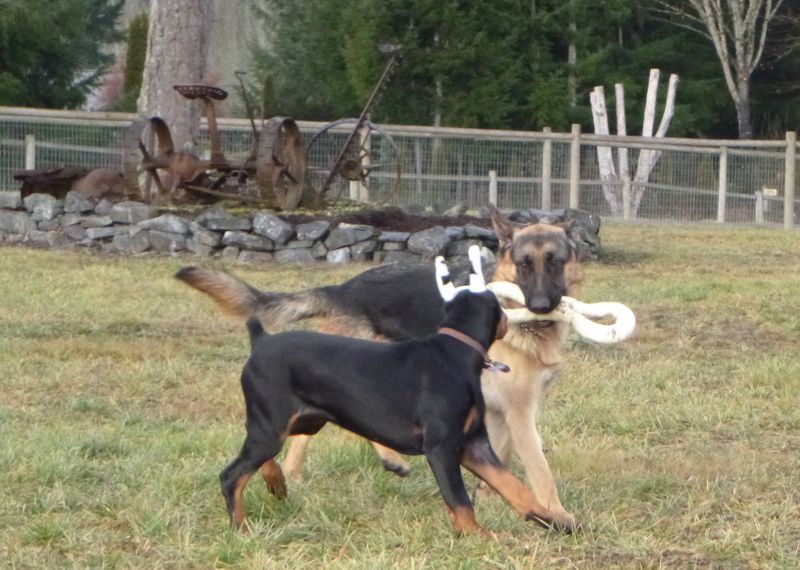 One of our boarders, Zeke, a 6 month old Dobie pup, was not eating his regular food. The stuff his guardians sent with him was Purina Pro Plan. I put down a dish of Orijen Red Meat right next to the Purina he was ignoring and guess what? He chowed down the Orijen like he hadn’t eaten in a week! Then, later that day at evening feeding time he chowed another bowl of Orijen like it was going out of style! In the interest of full disclosure I will tell you that I also sell dog food for a living, so I have a vested interest. Keep in mind though, that I realize most folks who read this blog live hundreds of miles from our store and will never buy so much as a biscuit from us. So, I’m not trying to sell you dog food, I’m trying to show you that sometimes when you have a feeding problem it’s because the food does not contain enough protein, it’s inappropriate for the dog’s needs and he knows it! The argument can easily be made that there are tons of dogs who do just fine on Purina and other supermarket brands that contain mostly corn. I would like to point out that for the first 30 or so years of my life I did just fine on sugar, fast food and beer. Things started to change in my thirties though. 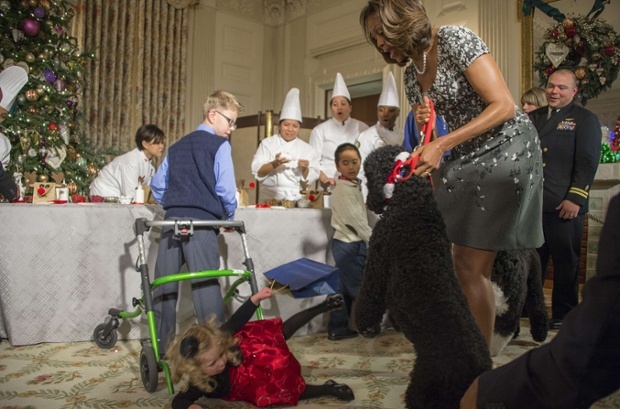 Another argument can be made that what a dog likes is not necessarily what’s best for him. That’s a good point. I have a dog that would happily gobble Twinkies all day long. That certainly doesn’t mean that Twinkies are a good dog food. At some point we need to put that argument aside and just look at this dilemma through the clarifying lens of common sense. Cheap dog food contains large volumes of corn and corn gluten meal. Why? Because it’s cheap! Ever see a dog grazing in a cornfield? I didn’t think so. Now that I’ve made myself sound like another whacky dog food snob, let me confess that I used to feed Purina to my dogs. 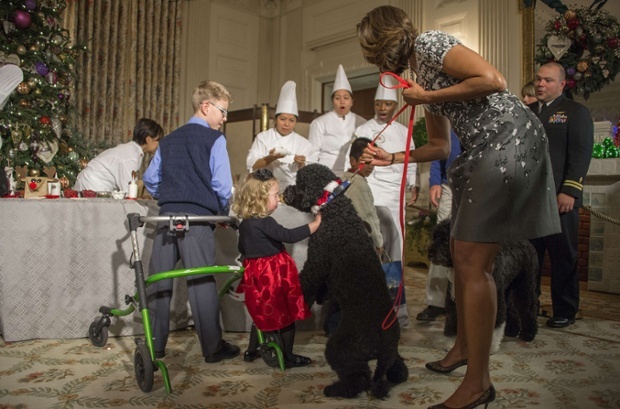 For many years, Purina and other popular brands were trusted names in the pet food industry. About 14 years ago, when I got a dog with hip dysplasia, I got to learn a lot about dog food. It started with the guy at the local feed store and I’ve been reading and learning about dog food and the dog food industry ever since. You can learn all this stuff yourself too. The info is all readily available. If you don’t have time to go on your own quest for the best dog food, just take this advice: If it’s cheap, it’s cheap for a reason. If it’s spendy, there’s a reason for that too. The easiest way to get a good dog food is to read the ingredient label. Look for protein percentage in the mid thirties to fourties and NO grain, i.e. rice, corn, soy, wheat, etc. Honestly, table scraps would provide a better diet for dogs than corn-laden kibble. Before WWII there was virtually no kibble on the market. Dogs ate table scraps, butcher scraps and bones. There are lots of advantages of feeding kibble including the ease with which we can provide consistency and balanced nutrition. The challenge is in providing a good healthy kibble. Because the dog will have little variation in diet, the kibble he eats needs to be of very good quality. Once again, the junk food analogy works well here. We can eat fast food once in a while, but if you chow down at McDonald’s three meals a day for few years you might eventually develop some diet related health issues. I suffered an enormous personal loss last Friday 12/13/13, when my Dad passed away after a long, painful battle with lung cancer. I have been unable to write anything the last few days, but rest assured that work continues here at Muck Creek Kennels. We have been training every day just as we normally do. I couldn’t continue to keep the dogs here if I thought for a moment that I was unable to properly care for them. 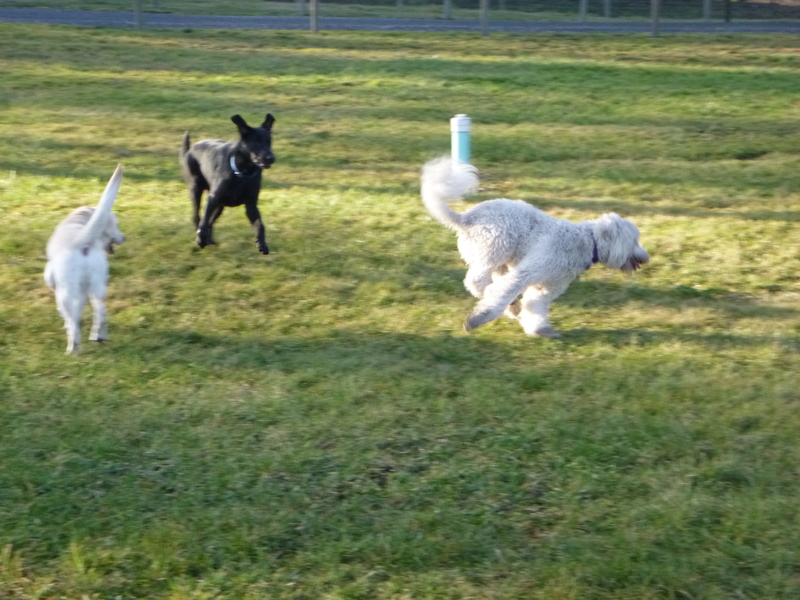 In reality I have spent more time than usual with the kennel dogs. Their unrelenting cheerfulness and goofy antics have sustained me and helped give me the strength I needed to keep moving through some difficult times. Over the course of the last week we have been working on recall with Diesel. Our goal is to have excellent response to the HERE command even in the face of major distractions. We’ve made some excellent progress! 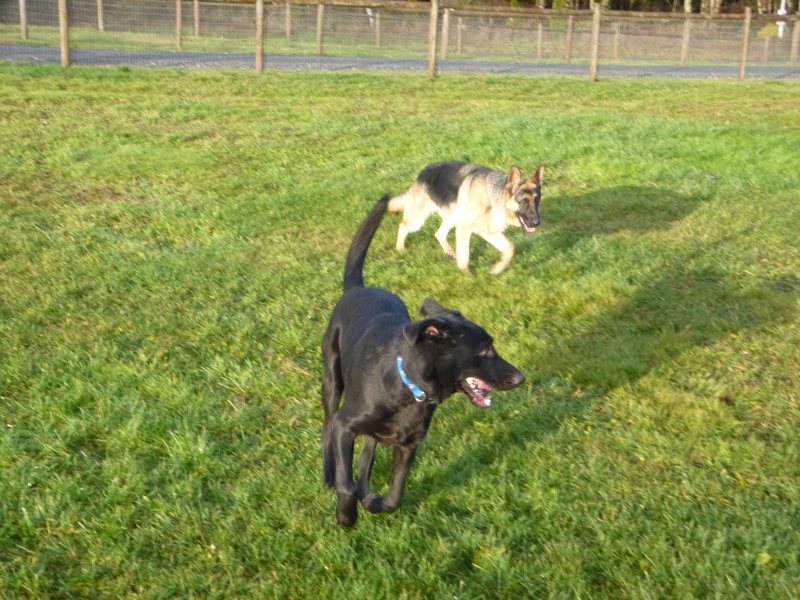 Jessie, who is here for basic obedience, has also made significant progress in his training. 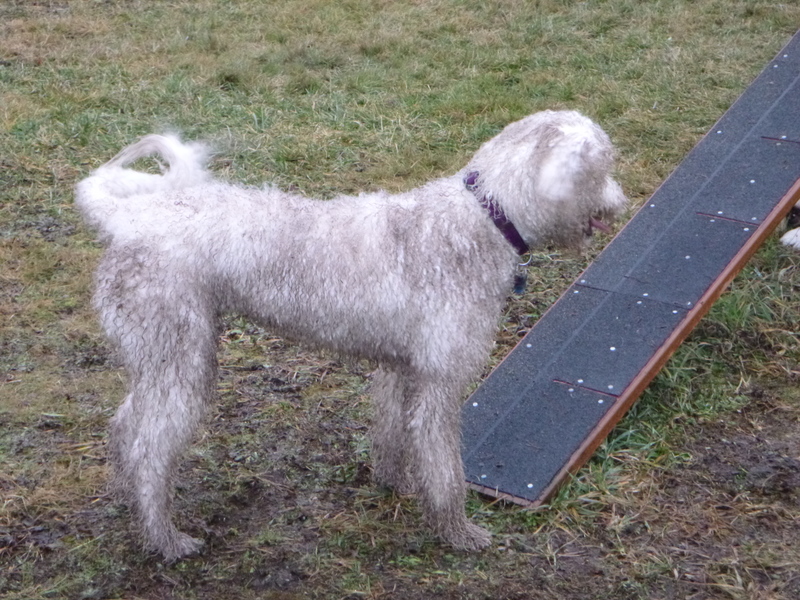 We are seeing good responses to all his basic obedience commands. Over the next few days we’ll be raising our criteria and motivating Jessie to show us what he is really capable of in terms of cooperation, focus and response. 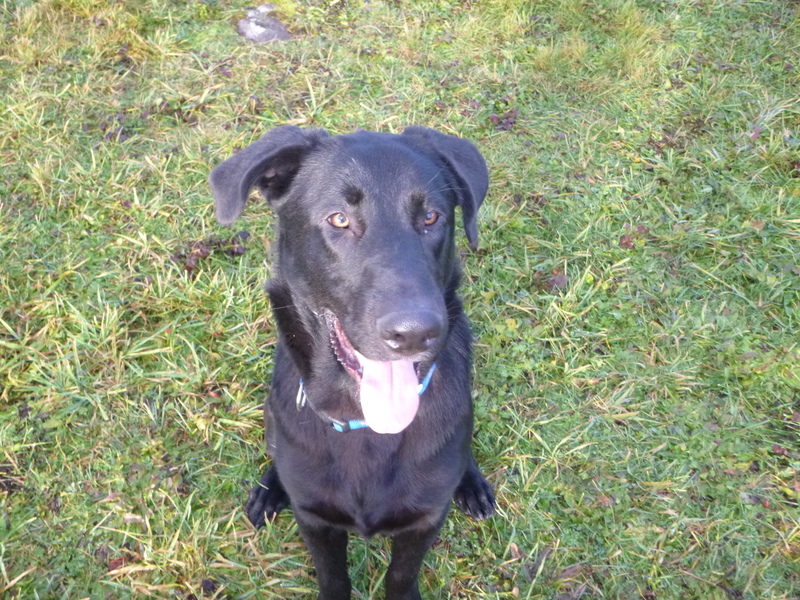 Jackson is a young fella who has been through some training here earlier. I was very pleased to see how he has held on to his previous training and how he is eager to work and learn more stuff. 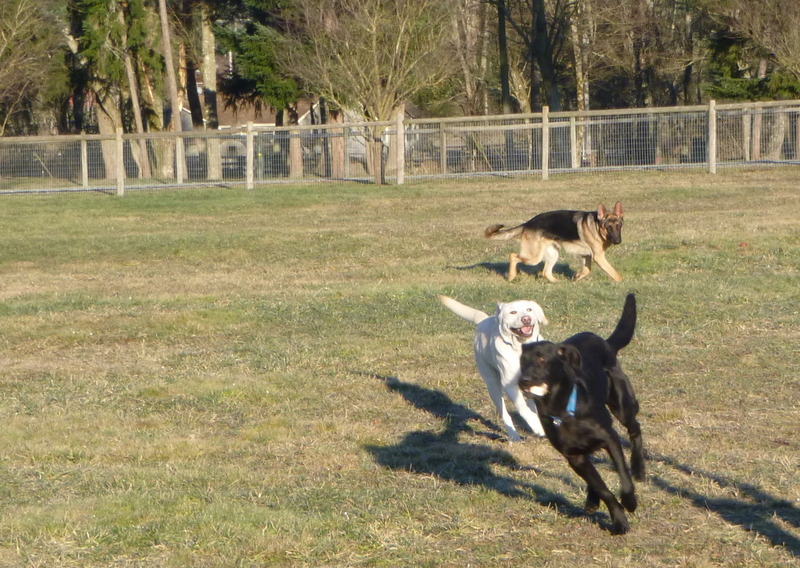 I know that his owner has plans to breed him with another really nice lab that has been trained here at Muck Creek. I’m particularly excited to find Jackson to be so tractable and eager to learn. When the time comes, he and Coco will make some really wonderful puppies together. 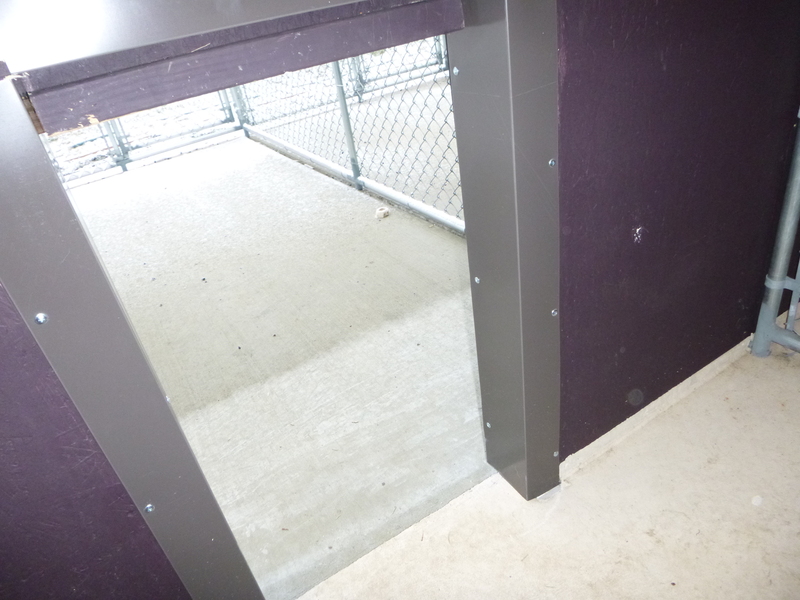 Over the last few days I have been rebuilding the doors that connect each kennel to its corresponding outdoor run. Originally I built the door frames out of wood because that’s what I had lying around. 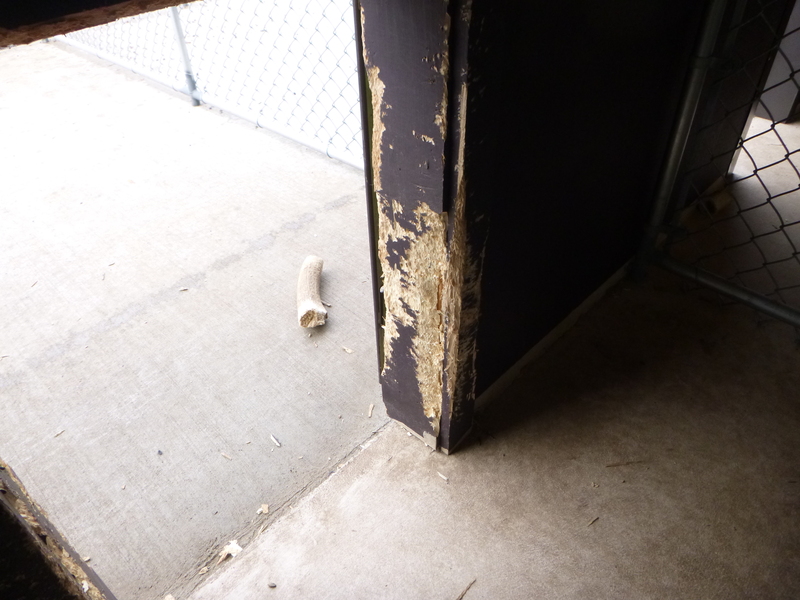 The dogs quickly showed me the error of my ways as they began to chew on the door frames, reducing my handiwork to a pile of slobbery splinters. Luckily, my friends David & Cynthia Froembling of Columbia Sheetmetal had a solution in the form of steel door-surrounds. I finally got those installed over the last couple of days. Being a professional sheetmetal guy, David would probably have preferred me to use powder coated screws so they weren’t so visible, but I had a box of regular sheetmetal screws that worked just fine. 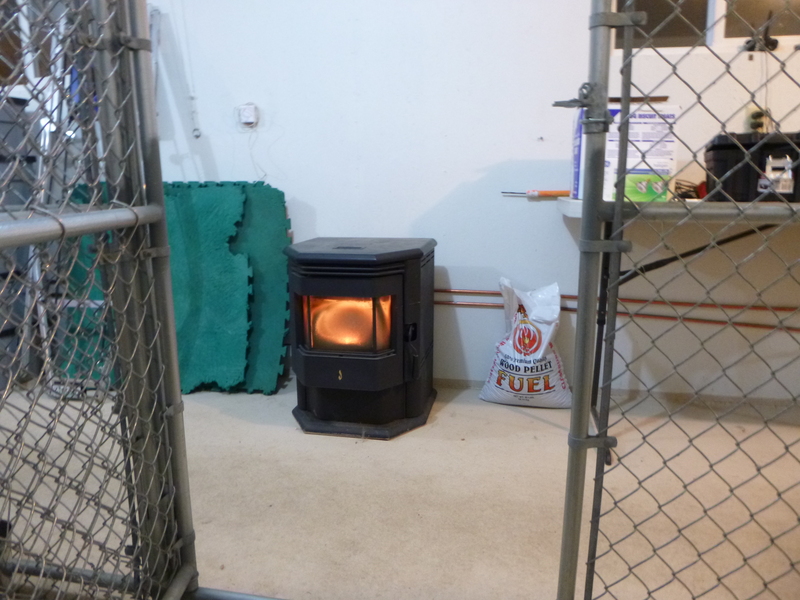 The dogs don’t seem to mind that it looks a little… well… screwy! Jessie’s training is underway. 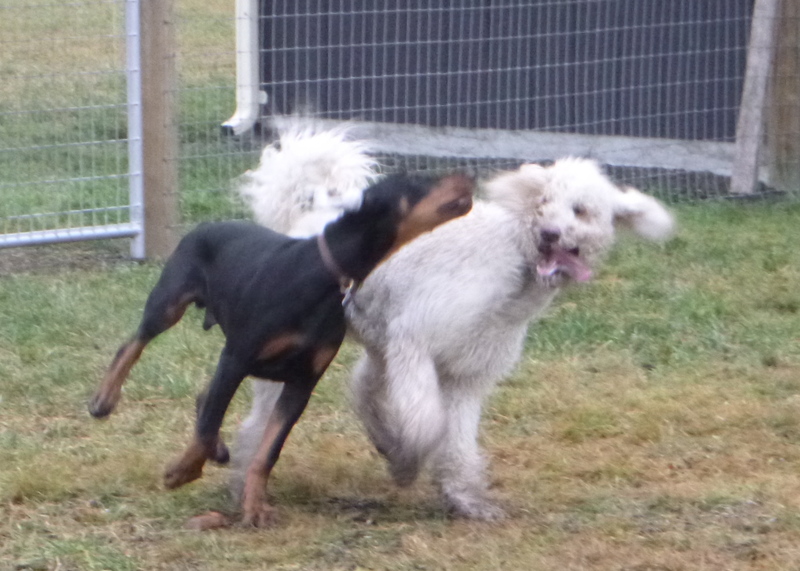 One of the things I’m doing to address his overabundance of energy is letting him romp with Diesel. It does them both good to burn off some of their energy and it allows me to work each of them in the presence of a powerful distraction. Diesel has enough obedience for us to expect good responses even with a moderate level of distraction. Jessie is just getting started so our expectations are much lower for him. 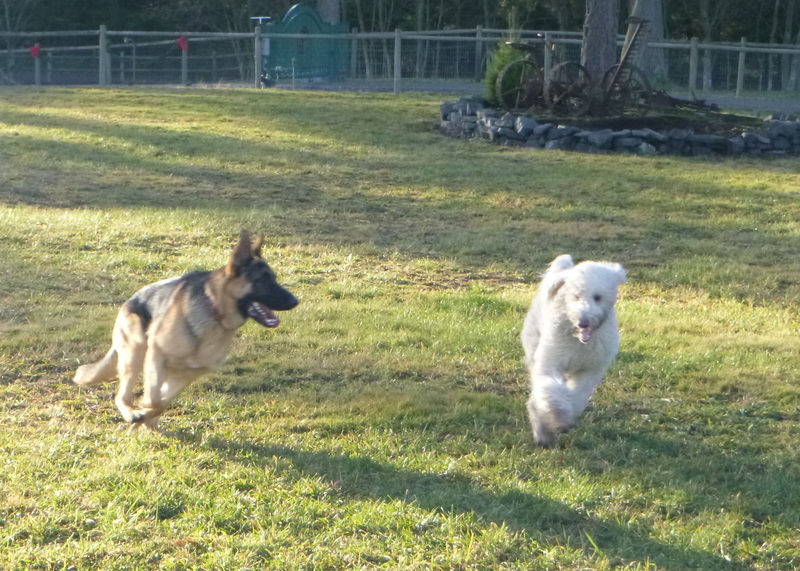 I let them run around the exercise yard and roughhouse for a about 20 minutes or so, then I put Diesel on lead and walk him through some Heel/Sit exercises while Jessie is still running around in the yard. After a few minutes of this with Diesel, I turn him loose and put Jessie on lead and do a few simple Sits and try to get him to hold his Sit in spite of the distraction Diesel provides. 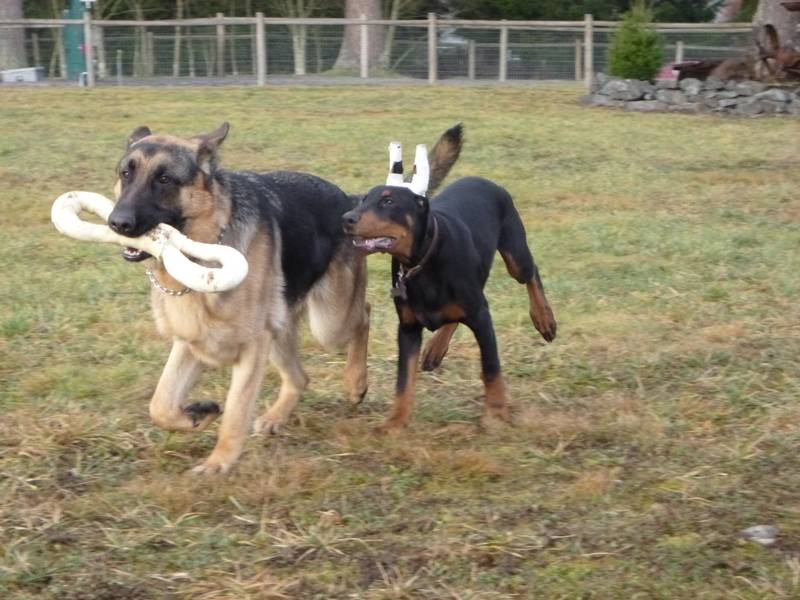 This is just part of their daily training, but it’s a convenient way to get them both some exercise. The obvious challenge is to keep them both connected to me. They can get so involved in their chasing and roughhousing that they forget about me, so I call them back every few minutes and put them both in a SIT, then release them for more fun and games. Another variation of this involves retrieving which Jessie LOVES. I know I’ll be using his love of retrieving for a motivator as his training progresses. By building some simple rules around a game he enjoys, we get the added benefit of those rules beginning to have relevance in other activities, whether we’re working or playing. The principle behind this kind of training is called the Premack Principle. We could spend a lot of time describing this in behavioral terms, but most of us already have a thorough understanding of Premack as “Grandma’s Rule”. Simply stated, Grandma’s Rule is this: “You can have some ice cream as soon as you eat your peas.” So… for Jessie the “peas” can be a SIT and the “ice cream” is a retrieving bumper being tossed so he can make a retrieve.